If you’re a fan of the New England Patriots, you probably don a Tom Brady jersey every Sunday in the fall. If you’re into the Avett Brothers, then you’re likely to rock a concert tee. But what if you love hiking? How do you show off your trail pride? Green Label Organic, a family-owned clothing company in Floyd, Virginia, has the answer. Green Label produces organic cotton tees that are socially responsible and environmentally sustainable. 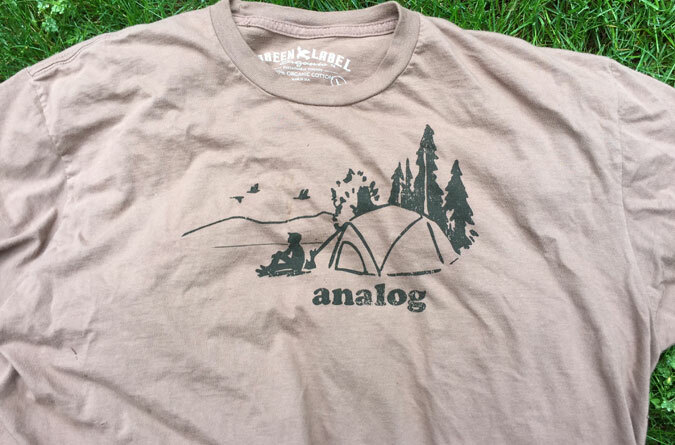 Along with a variety of other fun t-shirts in its catalog, Green Label has a line of hiking tees. Green Label is offering Northeast Hikes readers a coupon code worth $5 off your first Green Label Organic purchase. Use “North15” at checkout; offer expires October 13, 2015. The organic movement is well recognized when it comes to food, but the idea of organic clothing was new to me. I have to admit, it’s an eye opener. According to the Green Label website, cotton is one of the top crops for worldwide pesticide use. Pesticide-carrying cotton is used in food (cottonseed oil), clothing, mattresses, cotton swabs, and even tampons. Needless to say, Green Label uses 100% certified organic cotton, but they don’t stop there. The company boasts using eco-conscious, low-impact garment dyes, and the shirts are printed without using plastisols, phylates, or other harsh chemicals. The socially responsible aspect comes from Green Label products being made in America, sweatshop-free. Green Label provided Northeast Hikes a tee for the purpose of this review. Thanks to this I can attest that the shirts are truly as soft and comfortable as advertised, they are indeed preshrunk, and the tag-less labels provide added comfort. While I certainly can be accused of being enthusiastic about the products I write about, if you’ve read any other reviews on this site, then you know I also like to counterbalance the pros with cons. I’ll be honest, I’m struggling to find any drawbacks with this one. At a $34 retail value, the tees seem pricey at first blush, but when one considers the added expenses Green Label likely incurs from being organic and producing the shirts in America, it’s hard to knock them as expensive. The only other caveat for our audience is that the shirts are cotton, so they aren’t suitable for trail wear, but they aren’t intended or marketed as such.